The Global Research Alliance on Agricultural Greenhouse Gases brings countries together to find ways to grow more food without growing greenhouse gas emissions. It was launched in December 2009. On this page you can find more information about the Global Research Alliance (GRA) and why it is needed. The Global Research Alliance was launched in December 2009 and now has 56 member countries from all regions of the world. For more information on the membership, please see the Community pages. The Global Research Alliance is focused on research, development and extension of technologies and practices that help deliver ways to grow more food (and more climate-resilient food systems) without growing greenhouse gas emissions. The Global Research Alliance is founded on the voluntary, collaborative efforts of countries. Its membership and governance arrangements are underpinned by a Charter, signed by all participating countries. This Charter establishes the GRA Council, which is the representative body of all member countries. The current Chair of the Council is Germany. 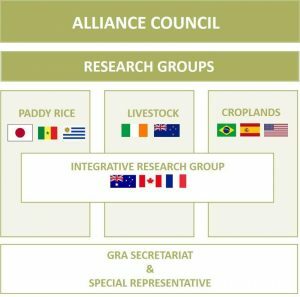 Members of the Global Research Alliance aim to deepen and broaden mitigation research efforts across the agricultural sub-sectors of paddy rice, cropping, and livestock, and to coordinate cross-cutting activities across these areas. Research Groups have been set up to address these areas of work, through work plans that bring countries and partners together in research collaborations, knowledge sharing and best practice, and capacity building among scientists and other practitioners. The aim is to develop breakthrough solutions in addressing agricultural greenhouse gas emissions. The Global Research Alliance promotes an active exchange of data, people and research to help improve the ways that agricultural greenhouse gas research is conducted and to enhance participating countries’ scientific capability. 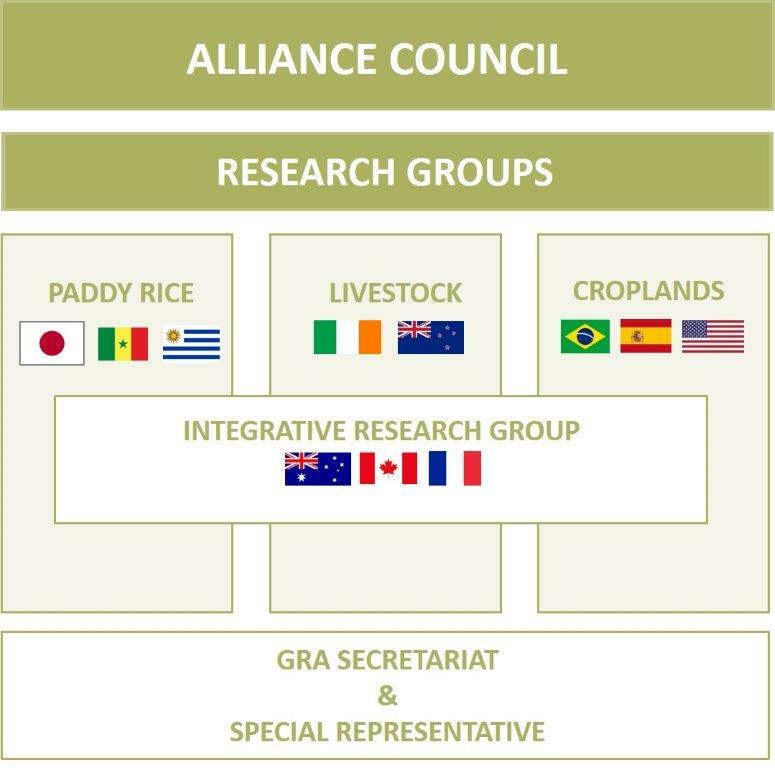 Global Research Alliance members work with farmers and farmer organisations, the private sector, international and regional research institutions, foundations, and non-governmental organisations to improve the sharing of research results, technologies and good practices and get these out on the ground. More information about the formation of the Global Research Alliance is provided in an editorial for the Carbon Management Journal [PDF] from June 2011. Agriculture plays a vital role in food security, poverty reduction and sustainable development. The agriculture sector is particularly vulnerable to the impacts of climate change and faces significant challenges in meeting a dramatic increase in global food demand, while reducing its contribution to greenhouse gas emissions. Agriculture currently produces 14 percent of the world’s annual greenhouse gas emissions; about the same as the transport or stationary energy sectors. According to recent predictions, a dramatic increase in food production will cause a 30-40 percent rise in agricultural emissions from 2005-2050. There are opportunities to reduce agricultural greenhouse gas emissions and increase soil carbon sequestration while still helping meet food security objectives. For example, improving the efficiency and productivity of agricultural systems through better management practices and techniques can go a long way to reducing emissions, and help build the resilience of these systems to meet the increasing demand for food in a sustainable manner. Many countries already have research underway to better understand, measure, and manage agricultural greenhouse gases emissions. By linking up these efforts through the Global Research Alliance, we can achieve faster progress towards the solutions needed for improving agricultural productivity and reducing its contribution to climate change. Building capacity and sharing knowledge and research experiences between countries and organisations is an important way of strengthening international links and increasing cooperation and collaboration. Several member countries of the Global Research Alliance have made fellowships and awards programmes available to international participants as a contribution to this effort. This page provides summary information on these schemes and links to find out more. If you would like us to list a new fellowship or award opportunity, please Contact Us. The United States Department of Agriculture, in cooperation with the United States Agency for International Development, has established a research fellowship scheme to support the participation of Global Research Alliance member developing countries. Competitively selected research fellows will work side-by-side with United States scientists on climate change mitigation in targeted research areas for up to 3 months. For more information, please visit the USDA page. The New Zealand Government, in support of the goals and objectives of the Global Research Alliance, has established a fellowship programme for emerging scientists (technicians, PhD students and Post Doctoral Fellow) from developing countries. This allows for placements in New Zealand research institutions and enables scientists to acquire skills in new/unfamiliar techniques and methods in livestock greenhouse gas emissions mitigation. For more information, please see the LEARN website. The Global Research Alliance on Agricultural Greenhouse Gases brings countries together to find ways to grow more food without growing greenhouse gas emissions.